Inspired by the Ahwahnee Hotel in Yosemite Valley, exquisite private estate is nestled in the rolling hills of Edna Valley wine country. 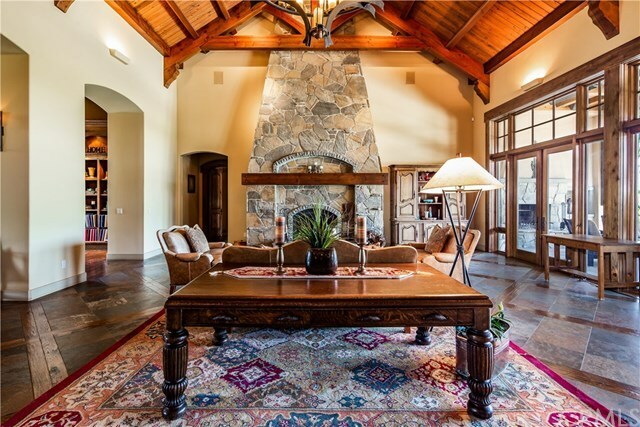 Located on nearly 5 acres in prestigious Stone Creek Estates, this property features panoramic views of local vineyards showcased by expansive floor to ceiling windows. Durable slate floors framed by quality hardwood panels, intricate moldings, and intricate tile works are among the many elegant details found throughout. The great room has vaulted ceilings and stunning stone fireplace showcasing timeless craftsmanship illuminated by thoughtful light placement. Fully equipped with three kitchens, grand dining room, pool and spa, outdoor bar, solar infrastructure and temperature controlled wine room,1200+ sqft shelved storage, this property was designed with grand entertaining and luxury in mind. With a remarkable 7734 square feet of living space, this property is comprised of 5 bedrooms in the main house with an additional 2 bedroom attached guest house. With an addition 2500+ square feet of covered outdoor entertaining area this home is ready for any occasion. Tesla charging stations are the epitome of efficiency, available in both three-car garages for convenient access. With an abundance of renewable energy production on the property and private well this property is virtually self-sustaining. This elegant estate truly embodies the union of technology and efficiency with the timeless finishes of historic architecture.